I don’t give Anna Karenina enough attention here on Tolstoy Therapy. In fact, I’ve never given the novel it’s own, dedicated post. Now that Rosamund Bartlett, author of my most-loved Tolstoy biography, has translated the novel, this will certainly change. In fact, the one translation I’ve read of Anna Karenina was the Pevear and Volokhonsky. I wasn’t overwhelmed by their translation of the novel, but considering my opinion of their War and Peace, I think it’s time I try something new. Bartlett’s translation provides the perfect opportunity. Published by Oxford University Press, the book is currently available as hardback and ebook (I’m reading the latter). I’m planning to provide you with a few articles on my opinion of the translation itself, alongside ways in which we can apply Anna Karenina to our own lives. These will be posted as I read the book over the coming weeks. An organism like a bubble will emerge out of infinite time, infinite matter, and infinite space, and that bubble will last for a while and burst, and that bubble is me. To say the least, the introduction is extensive, which is what I was expecting from the author (as a biographer of both Tolstoy and Chekhov). For some readers its detail and length might seem overwhelming – it took me several train journeys to finish – but I think there’s nothing wrong with skipping an introduction, or returning to it after finishing the book. ‘Everything was confusion in the Oblonsky’s house’, we read in the opening lines of the novel. Everything was also confusion in Russia. It is thus understandable why, at an age of such social and political upheaval, why some of Tolstoy’s more progressive readers were nonplussed by the idea of a novel about an aristocratic woman who has an affair with an army officer. It seemed out of date to them, and their author out of kilter with his age. But of course Anna Karenina is very much more than a society novel. Rather than simply stating facts and biographical details, Bartlett explains what these really mean for the novel. 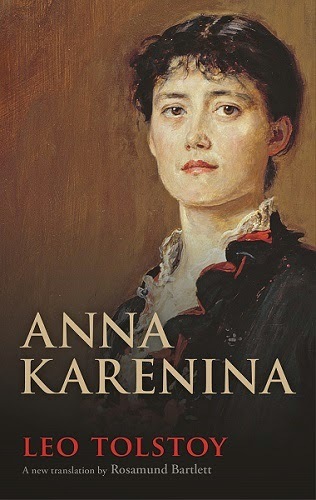 She situates the publication of Anna Karenina in a time and place which we can actually imagine and compare to modern society. The following year, Tolstoy read an article by Alexandre Dumas (fils) which responded to a recent controversial trial in which a husband was given a light prison sentence for murdering his unfaithful estranged wife. These factors – alongside an unfinished sketch for a story by Pushkin with an immediate narrative style catching Tolstoy’s eye – led to a draft of the novel’s opening first finding itself on paper. For new and existing readers alike, Bartlett’s introduction does much to illuminate Tolstoy’s shaping of Anna Karenina and our modern reading. The introduction also makes a neat defence of her translation decisions, which I’m curious to see on display in the novel itself (there’s nothing too surprising, but we’ll cover this later). So far, so good. Have you read Anna Karenina? How does a British translation with a comprehensive introduction sound to you? I love well written introductions to novels. They can indeed shed so much light on an author and upon a work. I often read them after finishing a novel as I often find it more enlightening. I bought this new translation a couple of weeks ago (haven't started yet though) but read a really interesting article about how Bartlett's translation is closer to the original Russian than the P&V. Am really excited to read it and am looking forward to hearing your thoughts in it too. Definitely! I remember reading a particularly good introduction to Daphne du Maurier's Rebecca after I finished the book – that added so much to my reading!